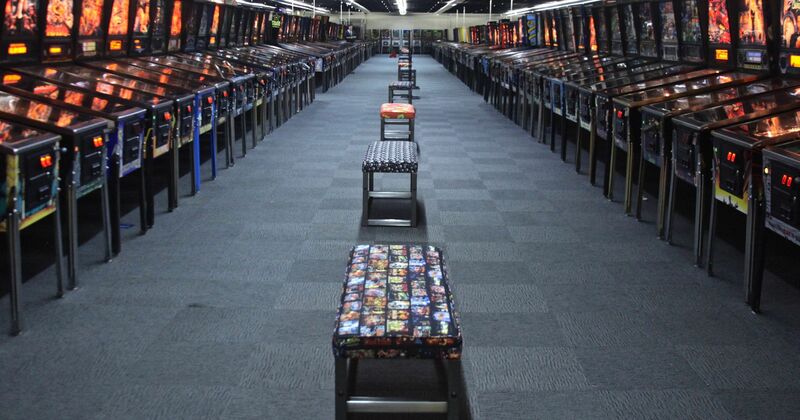 There’s a look, according to Chuck Casey, the curator at the Museum of Pinball, that first time visitors give after stepping into the 40,000 square-foot facility and seeing the rows upon rows of machines. A quick half-hour drive from Two Bunch Palms, the Museum of Pinball is one of the world’s largest collections of playable pinball machines, with units ranging from the origins of the game to limited edition pop culture tie-ins like “Transformers” and “Game of Thrones.” Steeped in nostalgia, the museum offers a total of almost 1,200 playable games (the museum also has a video game wing with around 600 options, from the Pong-style “Hockey” up to today) during its big events. The Museum of Pinball consists of the personal collection of John Weeks, housed on an 18-acre campus in Palm Springs-adjacent Banning. Weeks, a former arcade owner, began collecting the machines in the 1980s, and is still going – Casey says that he adds four to eight machines to the museum each month. It’s a process, Casey says, that gets easier as word of the museum spreads. “Attendees also note that they have one and he doesn’t,” he says. The key to planning a visit is finding a weekend when the museum is open. Powering that many machines at once is a major expense, one not likely to be recouped with everyday play at an arcade at the doorstep of the desert. 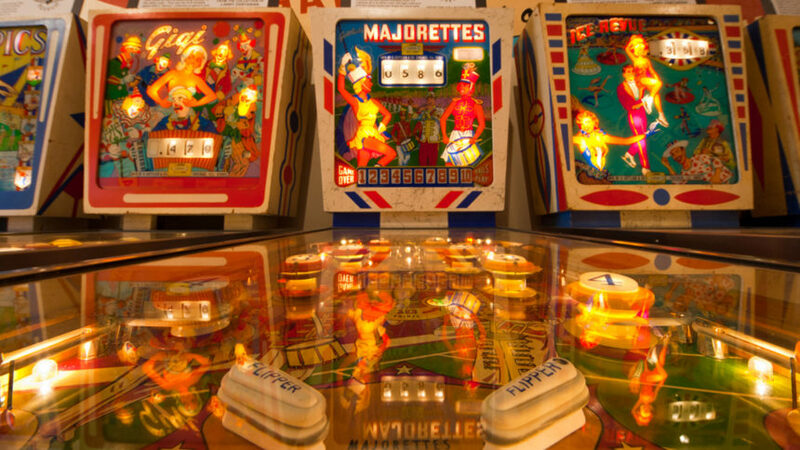 Events like the museum’s Arcade Expo and Halloween-themed “Pinball Madness” (which this year featured ornate costumes, a haunted house, and a Day of the Dead-themed, on-site wedding) give pinball fanatics a chance to play an unlimited number of games for an admission fee. It was at one of those Expos, in fact, that the museum landed in the record books, with 331 people setting the mark for most simultaneous pinball games in the Guinness Book of World Records. While piecing together a collection of hundreds of pinball machines is a tough task, keeping the majority of them working at any moment takes a miniature army. More than 80 people have helped Casey as volunteers since May alone. 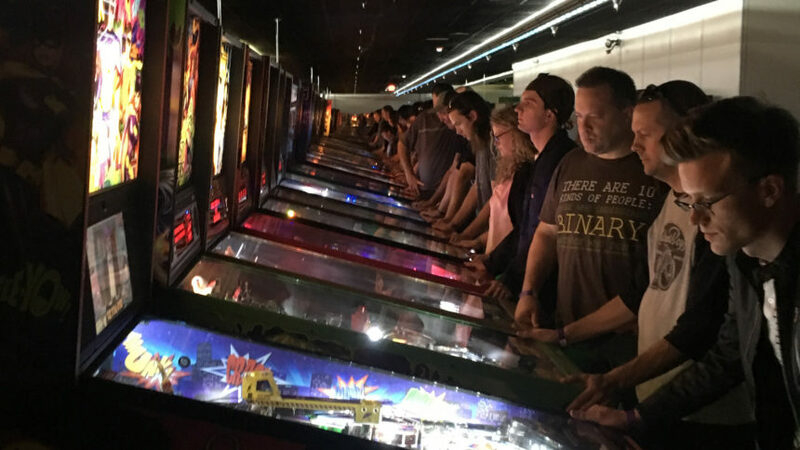 During this year’s “Pinball Madness,” that fight to keep machines operational is occasionally spotted; “mechanics” in red t-shirts walk the floor, looking for games malfunctioning, and intervening where necessary. What’s remarkable is how little it’s necessary. Some of the machines go back 75 years, but operate in largely the same fashion they did when they occupied corners at local malt shops. It makes for an overwhelming experience for aficionados, one that can tire a pinball player out in the same way that kids used to work off extra energy at the mall arcade.